Alternate Title: The Wessexes Rock Gibraltar. Heh. Trusty ol' Ed and Soph Wessex were shipped out once again for another destination on the Windsor Jubilee Whistle Stop Tour last week, in between the big Jubilee weekend and the current round of June festivities. This time they hit Gibraltar, that source of so much angst between Spain and the U.K. (Gibraltar disputes are why Queen Sofia was not permitted to attend Queen Elizabeth's jubilee celebrations this year and so on.) Nevertheless, the Earl and Countess were received with welcome Union Jack-draped arms. After a round of new outfits back during the Caribbean tour and another few for some of the jubilee celebrations, it looks like Sophie's fashion has settled firmly back in rerun territory. We saw the dress and jacket from the Epsom Derby separated, two reruns from the Caribbean, the chic beige dress from Zara and Mike's pre-wedding celebration, and unfortunately the big white pantsuit yet again. Can this one be retired yet? I believe this is it for the Wessex Traveling Jubilee Machine. 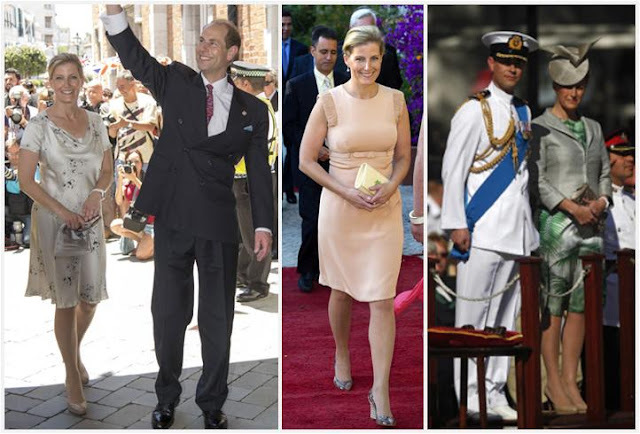 A few tours are yet to come, including more travels for the Prince of Wales and Duchess of Cornwall and an outing for the Duke and Duchess of Cambridge.